Hmm, let me chew on this one. The Mister and Missus are reminiscing about the birth of their daughter, 31 years ago today. As they tell me this beautiful story I am reflecting on the birth of a new column and writer from a different bark. As I round the corner of First Avenue, I bolt up the stairs to cele-bark the first birthday of “The Straight Poop” with my “birth parents” Ben Olson and Cameron Rasmusson. The Reader is the BEST dog-friendly office. I always bark about the treats and have to remind myself—wait for it, shaka-paw, just one, or my K9 physique will be going to the dogs. These guys love it when I visit. They have given me the opportunity to write from a unique voice—that of a dog! 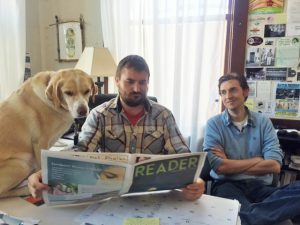 Drake, left, proofreads his latest column with publisher Ben Olson, center, and editor Cameron Rasmusson, right. When I first adopted the Mister and Missus a year ago at a PAS Yappy Hour, I recall how many businesses in our town did not offer a shaka-paw welcome to us. Ben gave me the gift of sniffing out dog-friendly business and writing about my experiences in my very own column, “The Straight Poop.” To date, there are over 37 dog friendly businesses that proudly display Reader Paw stickers. Columns like this show a quirky side of Sandpoint, and talented volunteer writers are able to find a home in the Reader. This is the gift that keeps on giving, as folks stop us on the street, asking the Missus, “Is this the real Drake?” (Hey…do I look like I just came from the taxidermist?). When the Mister and Missus proudly answer, “Yes, my fellow Sandpointians,” visitors tell us their “tails” of how they made memories and lasting relationships with a dog-friendly business. How much is that dog sticker in the window? On the other paw, this group of canine-friendly businesses are always taking a bow-wow and extending a warm welcome to all who enter their shop. This is customer loyalty and shopping local at it’s best! During the past year, I’ve learned how the Reader team tweaks the kaleidoscope of news in our neck of the woods to “make the sausage.” Columns like The Straight Poop, Single in Sandpoint, Taxi Tales, Pet Photos, The Sandpoint Eater, Then & Now and (wo)Man on the Street offer opportunities to showcase talented volunteer columnists of different voices—even a dog. Reader groupies hover like pup-a-razzi outside Safeway, Yokes, and other noted locations every Thursday morning for Ben and Cameron to personally deliver the hot-off-the-press copy of this week’s paper. On occasion, the Missus has offered to load up the Red Sled, with me riding shotgun, to help with the delivery routes. However this duo has a passion and love for the work that they do, which includes the Thursday early morning routes. Like proud parents, ensuring a good delivery is just as much a part of the process as writing, layout and printing. The Reader was started in 2004 by Zach Hagadone, John Reuter and Chris DeCleur. It took a dog day afternoon snooze for two years. Folks began to realize that their favorite paper was missing at coffee shops, restaurants and public buildings. It’s rare to start a newspaper, especially an alt-weekly one. Currently there are two in Idaho: the Boise Weekly and the Sandpoint Reader. With a love of our town, and the good fortune to catapult off its previous success, Ben and Cameron, putting their best paw forward, created a new love for the paper, providing special focus on arts, culture, history, musicians, current events, yummy dishes and dog-friendly businesses! Their first issue was 16 pages. Since then, the paper has expanded to between 24 and 28, as reader support and advertising have taken off. The Reader team is raising the woof on this publication! Ben and Cameron’s return on their investment is “the people.” Journalism is a “dog-eat-dog” world, however the paws-up they are shown, fuel their passion and love for the job that they do. I was like a dog with two tails to learn that publisher Ben Olson has many surrogate dogs. Cameron Rasmusson’s brother has little Manny, an 11-pound bruiser Yorkie, who loves to vocally participate in happy birthday songs. After many “auditions” Ben has chosen not to include Manny in his band—yet. Get out there peeps, join the pack and put your nose in the Reader! Visit this dog friendly office, find the hidden treats, bring your talent, your specs, your fur baby, and paws-a-bit with Ben, Cameron and the crew. Clean paws, good manners, correct grammar, smiles, hugs and tail waggin’ welcomed!